Amba Prasad The revolutionary struggle for freedom that went on within India as also the role of Indian expatriates has generally been treated on the margins. As such, many of its achievements and the heroic deeds of the patriots involved have rarely been highlighted. No wonder, we read or hear very little about many of such great sons of India. One such revolutionary hero Sufi Amba Prasad who laid down his life fighting for the liberation of the motherland in the city of Shiraz in Iran. A hundred years ago, on the morning of 21st January, 1917, ‘Sufi’ Amba Prasad then in the captivity of a brigade of “Seistan Force” or “ The East Persia Cordon” of the British Indian Army, under the command of Brigadier General Reginald Dyer ( of Jallianwala Bagh notoriety) stationed at Shiraaz in Iran was to face the firing squad. The previous day, his compatriot Kedar Nath Sondhi had faced the same on his way to martyrdom. As the dawn broke and the guards opened the door of the condemned cell, they found Sufi Amba Prasad sitting calm and motionless, in “deep meditation”. A guard called out his name but he did not move at all. The curious English guard then tried to shake and wake him up for the day and face his fate. But the motionless body of the Sufi just slumped on to its side. True to the word given to his compatriots, he had attained martyrdom while in deep meditation and not on the “British gallows “or “of a British bullet”. Sufi Amba Parsad’ was born in 1858 in Moradabad in the family of Sh Gobind Prasad Bhatnagar who lived in Mohalla Kanoongoan of Moradabad. Due to a genetic disorder he was born without his right hand. He was of a short stature and a very witty personality. He often used to joke that in his previous life while he was fighting against the British in the 1857 war of independence he lost his hand during the fight but at the time of his rebirth God forgot to restore it. Sufi Amba Prasad had his schooling in Moradabad. For his higher education he went to Bareilly where he passed FA and graduated in Law. Highly proficient in Hindi, Urdu, Persian and English languages, he however chose journalism instead of law as his profession and returned to Moradabad. He got married while he was still at Bareilly; however his wife died within two years of their marriage. This personal tragedy turned him towards spiritualism and he came under the influence of a sufi mystic Syed Mohammad Hussain of Moradabad. He not only learnt its philosophical aspects but actually adopted it as a way of life. In 1887 he established his own printing press in Moradabad and brought out a paper “Sitara e Hind”. In 1890 he started another paper named Jami-ul-Uloom. He was highly critical of the policies of the colonial government and a strong votary of Hindu Muslim unity in his writings. He also spent some time in Kashmir disguised as a cook of the British Resident there and brought out a highly investigative report on the activities of the British Resident Mr. Plowden in Srinagar, especially his intrigues against the Raja Partap Singh of Kashmir. This was published in the famous newspaper Amrit Bazzar Patrika. Out of sheer embarrassment the government had to recall Mr. Plowden from Kashmir. Needless to say he was always at the target of the British government. In 1897 he was framed in a sedition case by and was imprisoned for 18 month in Moradabad Jail. It was parallel to the Trial of Bal Ganga Dhar Tilak in Bombay under the same section and Tilak also got 18 months of imprisonment. However the fury of his writings against the atrocities of the British Government remained unabated and he was thus again jailed for seven years for sedition and forgery. After his release from Moradabad jail in early 1906, he briefly went to Hyderabad where the Nizam was favourably inclined towards him. But the thought of a struggling India always dominated his mind and soon he shifted to Lahore where he briefly joined a newspaper “Hindustan”. Soon fearing unrest among the high number of Punjabi soldiers in the British-Indian Army, all the bills against rights of peasantry of Punjab and enhanced revenue rates were withdrawn by the government and Lala Lajpat Rai and S. Ajit Singh were released from Mandalay in Nov 1907. Sufi Amba Prasad and his compatriots too returned to Lahore from Nepal and all these began to work again for their mission. Sardar Ajit Singh and Lala lajpat Rai Punjab at that time was the most active centre for agitation against British rule because of the anti agrarian policies of British administration. Sardar Ajit Singh (Uncle of Shaheed Bhagat Singh ) along with his brothers Kishan Singh and Swaran Singh and Lal Chand Falak , Mehta Nand Kishore, Ishwari Prasad and others were organizing the farmers against newly introduced laws impinging the tenancy rights and enhanced taxes . This agitation is popularly known as Pagri Sambhal Jatta movement. He joined them as a member of the Anjuman-i- Mohaban-i-watan and Bharat Mata Society and started editing their news paper “Bharat Mata” He also wrote articles for another paper “India” published from Gujranwala by Lala Pindi Dass. He was again prosecuted for sedition. However this time he was acquitted by Sessions Judge, to the great disappointment of prosecutors. Sardar Ajit Singh and Lala lajpat Rai were arrested in May 1907 and were deported to Mandalay in Burma. 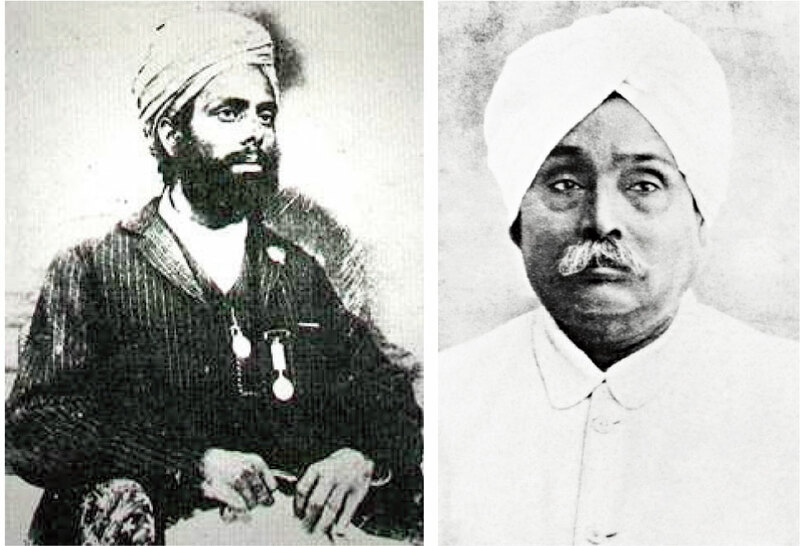 Sufi Amba Prasad along with Sardar Kishan singh and Mehta Anand Kishore escaped to Nepal to seek help from Prime Minister Rana Jang Bahadur Singh , who was indeed helpful and granted asylum. Soon fearing unrest among the high number of Punjabi soldiers in the British-Indian Army, all the bills against rights of peasantry of Punjab and enhanced revenue rates were withdrawn by the government and Lala Lajpat Rai and S. Ajit Singh were released from Mandalay in Nov 1907. Sufi Amba Prasad and his compatriots, too, returned to Lahore from Nepal and all these began to work again for their mission. They started publishing revolutionary tracts and books. Some of the books published by Sufi Amba Prasad and Sardar Ajit Singh are: “Baghi Masiha” , “Bandar Baant”, “Desi Fauj: Zafar mauj” , “Ungli Pakri Payncha Pakra” etc. In 1908 they instituted “Tilak Ashram” in Lahore for training the revolutionaries. Another news p a p e r “Peshwa” was also started by Sufi Amba Parsad from Lahore. A printing press called “Tilak Press” was started at Hoshiarpur for printing the revolutionary literature. However, because of t h e repression of the colonial government it was becoming difficult to carry out the revolutionary activities in Punjab. Therefore in August 1909 Sardar Ajit Singh and Sufi Amba Prasad along with Rishikesh Letha Thakar Das Dhuri and Zia ul Haq decided to leave for Iran. Here they established contacts with the Iranian revolutionaries who were already struggling to over throw the Quajar dynasty rule in Iran. Head of the Iranian Revolution Party. Syed Asadullah Mujatubik (Baladi-e-Bushehri) hosted them in the city of Bushier. However later on it was decided that it would be more useful and safe to be stationed in Shiraz. This courageous escape to Iran has been very vividly described by S. Ajit Singh in his memoirs “Buried Alive”. Sufi Amba Prasad stayed put in Shiraz to co-ordinate the activities of Indian revolutionaries who were finding safe routes to Europe through Russia. S. Ajit Singh left for Germany; Thakur Dass dhuri went to America while the two others returned to India to take up their revolutionary assignments. Because of his proficiency in Persian language and his Sufi leanings he blended very well in the Iranian milieu of that time. He continued collaborations with the Iranian revolutionaries. He started a newspaper by the name of “AABE- HAYAT” which continuously lambasted British imperialism and the Anglo-Russian belligerence in Iran. Sufi Amba Prasad also founded a school with modern curriculum in Shiraz and served as its Principal. He trained and guided several Iranian nationalist revolutionaries. He also wrote and published a book “Mohiban-e-Wattan” there. He was a very respected and a well known personality in Shiraz. He also founded a Sufi Society (Anjuman e Sufieh) in Shiraz. 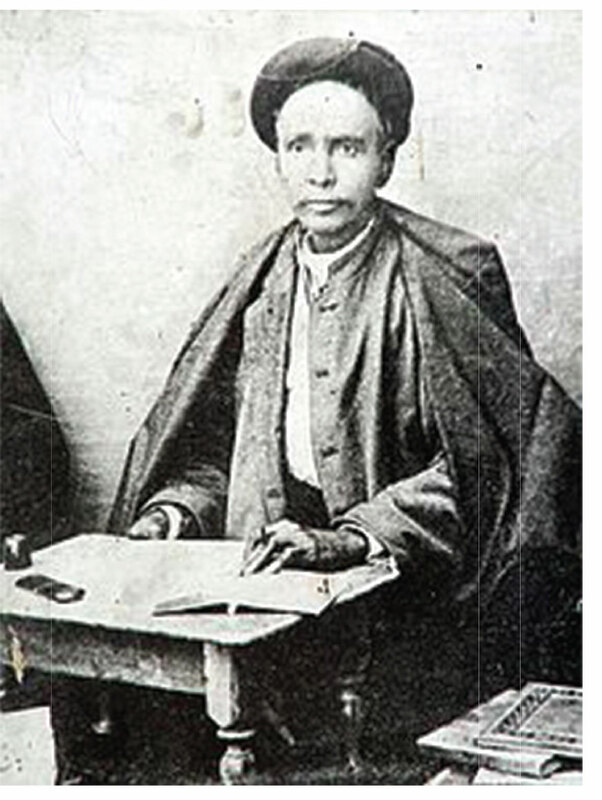 Sufi Amba Prasad stayed put in Shiraz to coordinate the activities of Indian revolutionaries who were finding safe routes to Europe through Russia. S. Ajit Singh left for Germany; Thakur Dass dhuri went to America while the two others returned to India to take up their revolutionary assignments. He was known in Iran as Agha Sufi-ye Hindi or by his Iranian aliases 'Mohammad Hoseyn Sufi; and Mohammad Hoseyn “Khadem e Shari'ati etc. etc. One of his Persian associates in Shiraz was “ Mirza Asghar Ali Hekmat” . He was an intellectual and a statesman who became minister of external affairs of the new government of Iran under Pahlavi dynasty. He also headed the Iranian delegation that came to New Delhi to participate in Asian Relations Conference in 1946. He was also Iranian Ambassador to India for some time. His memoirs written in Persian have been published as “RAHAVARD: E HEKMAT: Sharh-e Mosaferat-ha va Safarnameh-haye Mirza Ali Asghar Khan Hekmat Shirazi” (RAHAVARD: the thought, tours and travelogue of Mirza Ali Asghar Khan alias “Hekmat Shirazi” Ed. Dr Dabir Siyagi). This two volume book contains many references of Sufi Amba Prasad’s activities in Shiraz. In 1914 with the start of the World War I, the activities of the Indian revolutionaries abroad again picked up especially under the influence of the Hindustan Ghadar Party. The Ghadarites began to organize the Indian prisoners of war in Turkey, Germany, Mesopotamia, and the Middle East. In was planned that they will attack the British soldiers in Iran, move on to Baluchistan and then enter Punjab from there. As a result of such efforts the Indian Independence Army was organized by Sufi Amba Prasad and his associates with the active help of the German government agencies. He was joined by Kedar Nath Sondhi, Rishi Kesh Letha and Amin Chaudhry in this endeavour. The “Indian Independence Army”, marching from Shiraz , reached the borders of Baluchistan where the British army was very weak. This Ghadarite army attacked the frontier city of Karman and arrested the British Counsel and turned Karman into its base of operations. Then they defeated the British forces in the province of Sistan in Iran and chased the British forces into the Karamshir area of Baluchistan. From here they began advancing towards Karachi and reached the coastal towns of Gawader and Dawar in Baluchistan. But at this time the war in Europe began to take a turn for the better of the British. Soon Turkey was defeated and Baghdad came under British control. The German intelligence agencies also left Iran and thus the support and supply lines the Ghadar army were cut . This finally led to its defeat. They retreated to regroup in Shiraz. The British army, reinforced by their victory in Turkey and Iraq, attacked Shiraz and the retreating soldiery of the Indian Independence Army was encircled and was brutally massacred in Shiraz. Sufi along with Kedar Nath Sondhi fell prisoners in the hands of the British and were awarded death by firing squad.